Swedish climate activist Greta Thunberg met briefly with Pope Francis on Wednesday. The teenage environmentalist sat in the front row of the pope's general audience in St Peter's Square when the two spoke. "Thank you for standing up for the climate and speaking the truth. It means a lot," she told him. "God bless you, continue to work, continue. Go along, go ahead," he responded. Speaking after the meeting, Thunberg told Swedish newspaper Dagens Nyheter: "He was very friendly. He smiled the whole time." Thousands of students walked out of class in Sydney, kicking off global protests on Friday. They got the attention they wanted. Some Australian politicians hit back with criticism. "For action on issues that they think is important, they should do that after school or on weekends," said Education Minister Dan Tehan. Protesters in New Zealand invited adults to join the march. "If we go on strike on a school day, then they'll notice and they might want to do something," said 14-year-old student Inese, who didn't want to give her full name. And her prime minister is listening. Jacinda Ardern supports the strikes and has pledged NZ$100 million (€60 million/$68 million) to cut greenhouse gases. The movement has snowballed since 16-year-old Swedish activist Greta Thunberg began skipping school to protest in front of parliament last August. On March 15, her protest spread from Vanuatu to Hong Kong (pictured here), Tashkent to Madagascar. In Thailand, one of the world's top plastic polluters, students campaigned against single-use plastics. From Seoul to Singapore, each city's students spoke out in their own way. Here in South Korea, 100 students held signs saying "Too warm 4 school" and "Don't deny climate change." In Singapore, strict laws regulate public assembly so young people planned a virtual campaign on social media. In India, protests were seen in 36 different cities, including New Delhi, Mumbai, Hyderabad and Bangalore. Students in New Delhi chanted slogans demanding the Indian government stop using coal and act against climate change and air pollution. While German Chancellor Angela Merkel has supported the movement, some German students are still afraid to skip school. But not all. Protests were planned for 200 cities across the country. In the German capital, the crowds were huge by midday. In the western German city of Cologne, students braved the wet weather. Massive storms have recently battered that part of the country, though they only appeared to fan the flames of the students' protest. 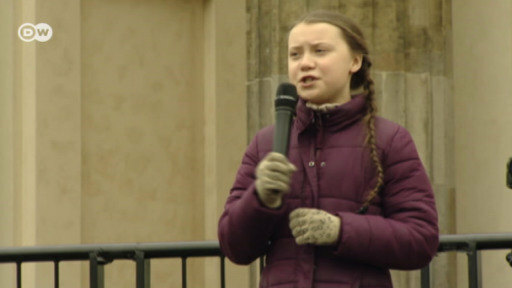 Greta Thunberg (center) led one of the many protests in Sweden. She said she was excited that protests had spread to 2,052 places in 123 countries. Asked if adults should strike too, she replied: "It's up to them, if they want their kids to have a future." Students in South African cities, including Cape Town and Pretoria, joined in the school strike. Africa, with more than 1 billion people, is expected to be hardest hit by global warming even though it contributes the least to greenhouse gas emissions. Strikes were held by students in cities across the country, including New York, Washington, Chicago, Portland, Oregon and St. Paul, Minnesota. In June 2017, US President Donald Trump announced that the US was withdrawing from the 2015 Paris agreement on mitigating climate change. Montreal drew among the largest crowds, estimated by organizers at nearly 150,000. The global movement saw a response from UN Secretary-General Antonio Guterres, who said he was inspired by the climate strikers to call a special summit in September to deal with "the climate emergency." The leader of the world's Catholics and Thunberg more or less see eye to eye on climate change. Francis has urged the world to protect the environment, even writing a 2015 document on fighting climate change. Since then he has advocated for the reduction of fossil fuels and calling for the world to convert to clean energy. Thunberg has inspired a generation of children to strike against climate change and hold regular protests against global inaction on the matter. Thunberg has chastised global leaders for not treating the threat of climate change as a life-threatening emergency. On Tuesday she called on the EU to reduce CO2 emissions by at least 50% in 10 years. The young climate activist has been awarded a special prize during Germany's best-known media awards show. She used her speech to call on media celebrities to spread the message on climate change.